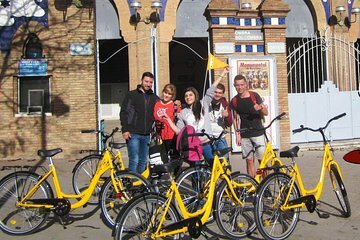 Enjoy an alternative sightseeing experience of Barcelona on a leisurely bike tour of the Catalonian capital. Follow a professional guide around the city’s winding streets and discover arresting landmarks like La Sagrada Famila, the Gothic Quarter and Las Ramblas. Gain fascinating insight into the city’s rich culture and heritage during regular stops, and venture to hidden corners to see how locals live. Capture photographs of prominent monuments like La Catedral, Santa Maria del Mar and La Pedrera and receive insightful recommendations from your guide when the tour concludes. Au cas où mon premier envoi n'aura pas été enregistré je réitère mon avis. This was a great tour. It ended up being only my son and I on the tour and we had a great experience. The lovely woman who toured us around was very knowledgeable and kind. We really had a great time. Excellent bike ride through very crowded streets - 11th being the Catalans Independence day. Added to the fun, even if we had to walk with the bikes a bit. Guide was v knowledgeable and was able to answer our questions. The bike shop is not the easiest place to find - but with any decent phone u should be ok. All in all a very good tour !